PURPOSE: To evaluate the short-term efficacy and safety of 0.005% topical latanoprost in Indian eyes. DESIGN: Prospective non-randomised open-label multicentric trial. 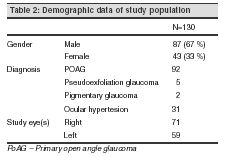 METHODS: One hundred and fifty patients with ocular hypertension (OHT), primary open-angle, pseudoexfoliation or pigmentary glaucoma were enrolled at four centers. Each center contributed at least 20 patients. Following baseline measurements, 0.005% latanoprost was applied topically once daily in the evening for three months. Patients were examined at 2, 6 and 12 weeks. The primary outcome measure was mean intraocular pressure (IOP) reduction. The mean diurnal variation of IOP (difference between highest and lowest IOP) at baseline and at 12-weeks was compared. RESULTS: One hundred and thirty of 150 enrolled patients completed the study. One randomly selected eye of each patient was included for analysis. At three months, latanoprost reduced the mean IOP from 24.9 (± 3.16) mmHg at baseline to 16.10 (± 2.7) mmHg, a reduction of 35.25%. 83% had a reduction in IOP of > 25%. The IOP reduction was maintained throughout the study period, and was not affected by gender or age of the patient. One eye did not show any response to the drug. Daytime diurnal variation of IOP was reduced from 4.5 to 2.9 mmHg. 20 patients had conjunctival hyperemia. Six patients had side effects requiring withdrawal from the study. CONCLUSIONS: In this short-term multicentric study, latanoprost effectively reduced IOP and stabilised the diurnal curve in Indian eyes. There were no clinically significant ocular or systemic adverse effects. Glaucoma is an optic neuropathy and intraocular pressure (IOP) is a causal risk factor. Several recent studies have reported the value of reducing IOP as treatment for primary open angle glaucoma (POAG).,  The initial treatment for POAG is usually medical with filtration surgery traditionally reserved for those in whom maximally tolerated medical therapy fails to control the disease. The safety and efficacy of latanoprost has been reported in several studies.- It is well known that there may be racial differences in the effect of drugs.,  India has an estimated 12.8 million patients suffering from glaucoma. Recently Hedman et al  reported that latanoprost or timolol statistically significantly reduced the mean diurnal IOP in a heterogeneous global population. The greatest difference in the mean diurnal IOP-lowering effect of latanoprost or timolol was observed in Mexican and Asian clinical trials. Patients with higher baseline IOP had better IOP reduction; patients with glaucoma responded better to latanoprost than those with OHT. Latanoprost was equally effective in newly diagnosed and previously treated patients. There is one report of the efficacy of latanoprost in a north Indian population . The purpose of this 12-week open-label multicentric study was to investigate the IOP lowering effect and safety of 0.005% topical latanoprost in Indian eyes for a 12-week duration. The calculated sample size was 64. To be eligible for the study, at least one eye of each patient had to meet the following criteria: minimum age 18 years with unilateral or bilateral primary open angle (POAG), pseudoexfoliation, pigmentary glaucoma or ocular hypertension. All patients had mean IOP higher than 21 mmHg at the baseline visit (mean of the IOP readings on same day). Patients who were on medication for glaucoma were controlled on a single drug. Exclusion criteria were baseline IOP lower than 21 mmHg (normal tension glaucoma), angle closure glaucoma or occludable angle on gonioscopy, IOP not controlled on more than one medication, history of ocular inflammation or infection within the last 3 months, history of intraocular surgery including laser procedures within 6 months prior to enrolment in the study, pregnant and lactating women, those already using latanoprost, ocular conditions precluding Goldmann applanation tonometry and known sensitivity to the vehicle component. The study was open-label and uncontrolled. The treatment period was three months. During the month preceding the start of the study, patients had a pre-study visit to assess for eligibility. Patients without previous glaucoma treatment could have their first visit at visit 1 (Baseline). The treatment period of three months comprised four visits, i.e. baseline (visit 1), day 14 (visit 2), week 6 (visit 3), and week 12 (visit 4). A deviation of ±2 days for visit 2 and ±1 week for subsequent visits was accepted (measured from visit 1). Patients with persisting adverse events at study termination had a follow-up visit within 2-4 weeks after end of treatment. Interim visits could be scheduled at the discretion of each investigator. Patients who qualified for the study and were currently using ocular hypotensive medication underwent a minimal washout period as follows: topical -adrenoreceptor antagonist 3 weeks, topical adrenergic agonist 2 weeks and cholinergic agonist and systemic carbonic anhydrase inhibitor for period of 5 days. The washout was followed by the pre-study visit. Patients were enrolled in four centers from May 1999 to April 2000. Ethics committee approval was obtained from all centers before commencement of clinical trial. Informed consent was obtained from each patient. All the patients underwent visual field examination at the first day and at the end of the study. Visual fields were performed on the Humphrey field analyzer using the SITA (Swedish Interactive Testing Algorithm) standard program. Systemic medications including beta-blockers were continued during the study. New systemic medications were permitted provided they had no known effect on the IOP. If a drug with a known effect on the IOP was deemed necessary for the patient, the patient had to be withdrawn from the study. At the baseline visit, medical history from each subject was obtained, including a list of all systemic medications. A complete ophthalmic examination was performed which included slitlamp examination, Goldmann applanation tonometry, gonioscopy, dilated fundus examination, stereoscopic biomicroscopy of the optic disc with 60 or 90 diopter lens. IOP′s were measured at 09:00 Hour (±1 hour), 13:00 Hour (±1 hour), and 17:00 Hour (±1 hour). Three IOP readings were recorded each time and mean of each was used for analysis. Slitlamp biomicroscopic examination was done before instillation of 2% fluorescein to look for aqueous flare and anterior chamber cellular response. Iris colour was noted at the baseline visit but no photographs were taken. Each patient was given three vials of the study drug. Two vials were dispensed at the baseline and the third at the 6-week visit. The instructions were to change the vial at the end of 4 weeks and 8 weeks. Patents were asked to return the used vials. Patients were advised to install the eye drop at bedtime, preferably at the same time every day (8 PM). They were taught how to apply the medication with the help of a dummy vial. Visual acuity was recorded at 2 weeks and 6 weeks. IOP was recorded at 09:00 Hour (±1 hour). Slitlamp examination was performed, especially to look for change in iris color and presence of uveitis. At the 12-week visit best-corrected visual acuity and objective refraction were recorded. IOP was measured at 09:00 hour (±1 hour), 13:00 hour (±1 hour), and 17:00 hour (±1 hour). A complete ophthalmic examination including dilated fundus examination was done. Visual field examination was repeated and compared to the baseline field. Throughout the study duration, patients were monitored for ocular and systemic adverse effects. The diagnosis of adverse effects including ocular hypersensitivity or allergy was left to the examiner. An adverse event was defined as any untoward medical occurrence in a patient during the course of the study period; the event did not necessarily need to have a causal relationship to the drug. Adverse events (AE) were graded for severity as mild, moderate or severe. Mild: did not interfere with the subject′s routine function. Moderate: interfered to some extent with subject′s routine function. Severe: interfered significantly with subject′s routine function. The occurrence of a severe AE led to withdrawal of patient from the study. In case of an adverse event the investigator was required to assess the relationship to the study treatment (definite, possible, unlikely or none) and report the outcome. At every visit patients were queried specifically about ocular comfort. For patients who had both eyes included in the study, only one randomly selected eye was included for analysis. Eyes were selected randomly using computer-generated blocks. In patients with only one eye eligible for the study, this eye was used for analysis. The primary outcome measure was mean IOP reduction. This was analysed by comparing mean IOP at 12 weeks to mean baseline IOP using Student′s "t" test 18 The level of significance was set at P < 0.05%. At baseline and at the end of study IOPs were measured at 09:00 hours (±1 hour), 13:00 hours (±1 hour), and 17:00 Hour (±1 hour). These IOPs were compared to determine the effect of latanoprost on daytime diurnal variation. Results were also analysed using percentage of IOP reduction. A reduction of 25% or more IOP from baseline IOP was considered success of treatment. 95 percent confidence intervals (C.I.) were used to compare IOP reduction in our study patients to other latanoprost multicentric studies. 130 of 150 enrolled patients followed the protocol and completed the study duration of 12-weeks and were available for analysis. Each centre contributed at least 20 patients. [Table - 1] shows details of the 20 patients who for various reasons were not included for statistical analysis. [Table - 2] shows demographic details of all patients. The iris colour was homogenously brown in 134 patients; 4 had a homogenously blue, grey or green; 1 each had blue-brown and yellow-brown colour. Mean best-corrected visual acuity (BCVA) was 0.91 (±0.04) logMar at first visit and 0.9(±0.06) logMar at last visit. [Table - 3] and [Figure - 1] show mean IOP at various follow-up visits. Mean IOP reduction at the last follow-up visit was 8.9 mmHg (± 1.7), a 35.25% IOP reduction from baseline. Compared to baseline measurements latanoprost caused a significant (P < 0.001) IOP reduction throughout the duration of therapy. It also shows mean IOP at baseline and three-month visit at 9 hours, 13 hours and 17 hours. IOP reduction was similar at all studied hours. [Table - 4] and Figures 2 and 3 shows percentage IOP reduction and eyes achieving specific IOP level at last visit. 108 eyes (83.1 %) had 25% or more IOP reduction. One eye did not show any response to the drug. 105 (80.8 %) eyes achieved IOP of 18 mm Hg or less and 65 (50 %) eyes achieved less than 16 mm Hg IOP at last visit. IOP reduction in the glaucoma group was 36. 5% compared to 31.8 % IOP reduction in OHT group. In previously treated glaucoma patients latanoprost reduced IOP by 37.4 % compared to 28.9% in those newly diagnosed and previously untreated. This difference was significant (P =0.01). Conjunctival hyperemia was the most common side effect; this occurred in 20 patients (15.4 %). No one required discontinuation of medication. Other side effects are listed in [Table - 6]. At the final visit, two patients were suspected to have worsening of the visual field. Both were advised repeat fields. The worsening could be confirmed in one patient; the other was lost to follow up. No patients had alteration in any of the following baseline measurements: visual acuity, slitlamp biomicroscopic examination, anterior chamber flare or cellular response. As photographs were not a part of the protocol, it is not possible to comment on the change in iris colour. No patients had a gross change in iris colour. Two patients had to be withdrawn from the study due to ophthalmic side effects. One complained of colored haloes; the symptoms disappeared on stopping the drug. Another patient developed acute angle closure glaucoma. This patient had advanced cataract. The investigator ascribed the angle closure to lens intumescence. Serious adverse events occurred in 5 patients (4%). None could be directly attributed to the drug. 20 patients (15.4 %) reported the adverse events listed [Table - 6]. Five patients had systemic illnesses requiring hospital admission that were not drug related adverse events. Latanaprost was discontinued for the following reasons: two patients were hypertensives who required additional systemic medication for control; one was admitted to hospital with a lower respiratory tract infection and stopped latanoprost on his own; the fourth patient was a severe diabetic who had to be admitted and the drug stopped. One patient had a fracture and required admission to hospital. All these were considered severe adverse events, though none were related to the drug. In the current era of globalisation we may be called upon to treat people from different countries. With the introduction of newer medications for the management of glaucoma, studies that consider IOP lowering efficacy and safety in different ethnic groups are important in clinical decision-making. We found a 35% reduction in IOP amongst patients who completed the study duration of 12 weeks. The effect of drug was evident at the first visit and was constant during the study period. It is known that Latanoprost′s action starts within the first 2 weeks, maximizes within first 6 weeks and than onwards stabilises without short or longterm drift. Our results are similar except that due to short-term nature of study we cannot comment on the drift. The literature reports IOP reduction ranging from 25% to 32%. - [Table - 7] and Figure 4 compare our results with other multicentric studies. The lack of masking and regression to the mean might explain the greater pressure lowering effect seen in our study. Our results were similar to that reported by the U.K Latanoprost Study Group; IOP reduction was significantly more than in the US and Scandinavian multicentric studies. The Baltimore survey reported that the black population was less responsive to medical management. While 21% of the U.S Latanoprost Study group was pigmented there was no difference in IOP reduction between pigmented and white races. At 12 weeks a 25% reduction from baseline was obtained in 108 eyes (83.1 %); a 30% reduction in 99 eyes (76.1 %). Two patients had IOP reduction less than 10% and one did not show any response to the drug. Latanoprost significantly reduced daytime diurnal variation in our patients; diurnal variations are known to be an independent risk factor for progression of glaucoma. Side effects other than conjunctival hyperaemia were minimal. The frequency of hyperaemia is similar to that reported. The patient who developed acute angle closure was explained by rapid progression of the cataract. We could speculate that in a predisposed eye rapid egress of aqueous from the peripheral anterior chamber might actually precipitate acute closure. Even if this mechanism were possible, it would be unlikely in a wide-open angle, which was the inclusion criterion. As a glaucoma specialist examined the case, an error in gonioscopy was a remote possibility. Cells and flare were not detected on slitlamp examination. Other studies including those using laser flare meters report similar findings,-, , , and Hotehama and Mishima. (IOVS, abstract 1992;33:s2142). Iris pigmentation is a recognised complication of latanaprost treatment reported by most long-term trials. The short duration of treatment and purely clinical examination used to grade a change in pigment does not permit us to comment on this complication. It appears that a certain type of iris is at particular risk for this complication. In our study we had 95% of patients with homogenous brown iris compared to only 51% in the US study group. Our darker irises may mask the effect of Latanoprost. Our study had several limitations. The most important was the open label and non-randomised design. Lack of masking and regression to the mean might explain the better results obtained. In summary this multicentric Indian trial reports the efficacy of latanoprost in Indian eyes. It demonstrates an IOP lowering effect similar to the ones reported worldwide; lack of response was rare. Latanoprost also stabilised the daytime diurnal curve. There were only two drug-related side effects requiring withdrawal of drug. Ritch R, Shields MB, Krupin T, editors. The Glaucomas, 2nd ed. 1996. St. Louis: Mosby- Year Book. pp 753-768. Heijl A, Leske MC, Bengtsson B, Hyman L, Bengtsson B, Hussein M. Early Manifest Glaucoma Trial Group. Reduction of intraocular pressure and glaucoma progression: results from the Early Manifest Glaucoma Trial. Arch Ophthalmol 2002;120:1268-79. The Advanced Gglaucoma Intervention Study (AGIS). 7. The relationship between control of intraocular pressure and visual field deterioration. The AGIS Investigators. Am J Ophthalmol 2000;130:429-40. Alm A, Villumsen J. Ph XA34, a new potent ocular hyporensive drug, A study on dose-response relationship and on aqueous humor dynamics in healthy volunteers. Arch Ophthalmol 1991;109:1564-68. Villumsen J, Alm A. Ph XA34, a prostagndins F2a analogue Effect on intraocular pressure in patients with ocular hypertension. Br J Ophthalmol 1992;76:214-17. Camras CB, Schumer RA, Marsk A, Lustgarten JS, Serle JB, Stjernschantz J, et al. Intraocular pressure reduction with Ph XA34, a new prostagndins analogue, in patients with ocular hypertensions. Arch Ophthmol 1992;110:1733-38. Kjellgren D, Douglas G, Mikelberg FS. The short-time effect of latanoprost on the intraocular pressure in normal pressure glaucoma. Acta Ophthalmol Scand 1995;73:233-36. Mishima HK, Masuda K, Kitazawa Y, Azuma I, Araie M. A comparison of latanoprost and timolol in primary open-angle glaucoma and ocular hypertension. A 12-week study. Arch Ophthalmol 1996;114: 929-32. Azuara-Blanco A, Katz LJ, Spaeth GL, Wilson RP, Moster MR, Flartey KJ. Effect of latanoprost on intraocular pressure in patients with glaucoma on maximal tolerated medical treatment. Br J Ophthalmol 1997;81:1116-16. Camras CB. Comparison of latanoprost and timolol in patients with ocular hypertension and glaucoma: a six-month masked, multicenter trial in the United States. The United States Latanoprost Study Group. Ophthalmology 1996;103:138-47. Watson PG, The Latanoprost Study group. Latanoprost: two Years' experience of its use in United Kingdom. Ophthalmology 1998;105:82-87. Alm A, Widengard, Latanoprost: Experience of 2-year treatment in Scandinavia. Acta Ophthalmol Scand 2000;78:71-76. Hedman K, Larssom LI. The Effect of Latanoprost Compared with Timolol in African-American, Asian, Caucasian, and Mexican Open-Angle Glaucoma or Ocular Hypertensive Patients. Surv Ophthalmol 2002;47:S77-S89. Yasuhara H. Ethnic factors in evaluation of drug efficacy and safety. Nippon Yakurigaku Zasshi 1994;104: 67-78. Katz IM, Berger ET. Effects of iris pigmentation on response of ocular pressure to timolol. Surv Ophthalmol 1979;23:395-98. Sihota R, Saxena R, Agarwal HC, Pandey RM, Gulati V. Peak pressures: crossover study of timolol and latanoprost. Eur J Ophthalmol 2003;13:546-52. Rao PS, Richrd J. An introduction to biostatistics. 3rd edition, Prentice Hall. 1999;70-75. Bunce C, Hitchings R. Glaucoma and quality-of-life. Ophthalmology 1999;106:440 - 40. Sommer A, Tielsch JM, Katz J, Quigley HA, Gottsch JD, Javitt J, Singh. Relationship between intraocular pressure and primary open angle glaucoma among white and black Americans. The Baltimore Eye Survey. Arch Ophthalmol 1991;109:1090-95. Asrani S, Zeimer R, Wilensky J, Gieser D, Vitale S, Lindenmuth. Large diurnal fluctuations in intra ocular pressure are an independent risk factor in patients with glaucoma. J Glaucoma 2000;9:134-42. Bron AM, Emmerich KH. Latanoprost versus combined timolol and dorzolamide. Survey Ophthalmol 2002;47:S148-S154. Guuiffre G. The effects of prostaglandin F2a in the human eye. Graefes Archives of Ophthalmology Clin Exp Ophthalmology 1985;222: 39-41. Ziai N, Dolan JW, Kacere RD, Brubaker RF. The effects on aqueous dynamics of PhxA 41, a new prostagndins F2a analogue, after topical application in normal and ocular hypertensive eyes. Arch Ophthalmol 1993;111:1351-58. Support: Pharmacia India Pvt Ltd.
Cheong, M.T., Kodisvary, M., Raja, V.S., Azhany, Y., Zilfalil, B.A., Liza-Sharmini, A.T.
Narayanaswamy, A., Neog, A., Baskaran, M., George, R., Lingam, V., Desai, C., Rajadhyaksha, V.